In honor of its 50th anniversary, Russell Original Art Review (ROAR) committee commissioned Dennis Schiel of Hays to create a 20’ x60’ mural. 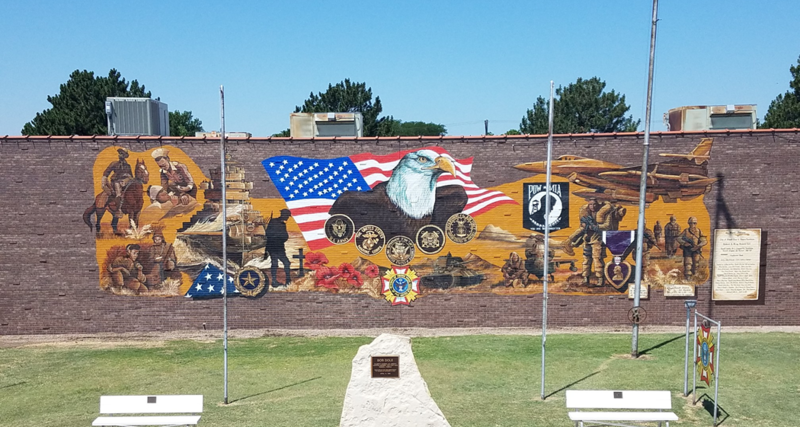 This mural, honoring America’s military veterans, was painted on the east exterior side of the Russell Veterans of Foreign Wars 6240 post home. 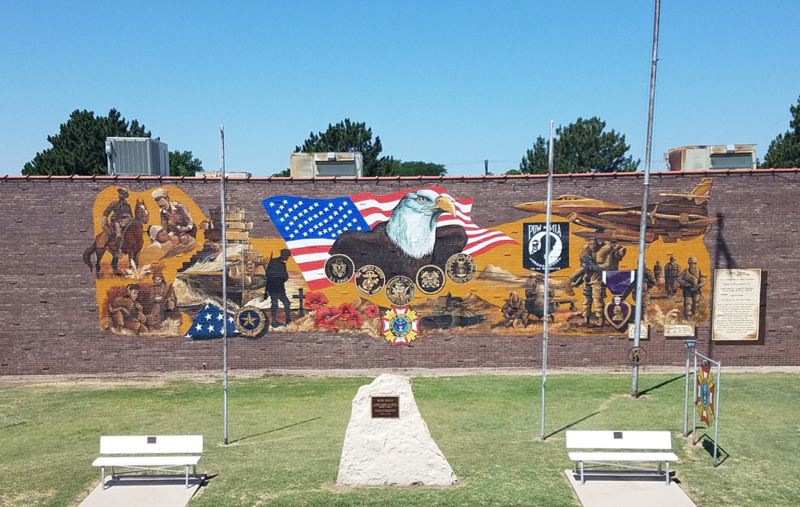 The mural was painted in earth tones, with the exception of the American flag, bald eagle, poppies, VFW logo, and a Purple Heart medal. The mural depicts a timeline of U. S. military history, as well as U. S. military symbols. It is the hope of the committee to have lights and a kiosk in place before the dedication of the mural on October 13, 2018. Located at 8th St. and Main St. The mission of Russell’s Original Art Review, better known as ROAR, is to promote the visual arts throughout the State of Kansas. That is why the committee undertook the project of replacing the mural located at 8th and Main Street. Many citizens and members of local organizations expressed the need to repair or replace the mural. As concerned citizens, members of ROAR undertook this significant project to enhance the downtown area. ROAR felt that the beauty of Russell was, and is, an important component of economic development that is key to the wellbeing of the Russell Area. 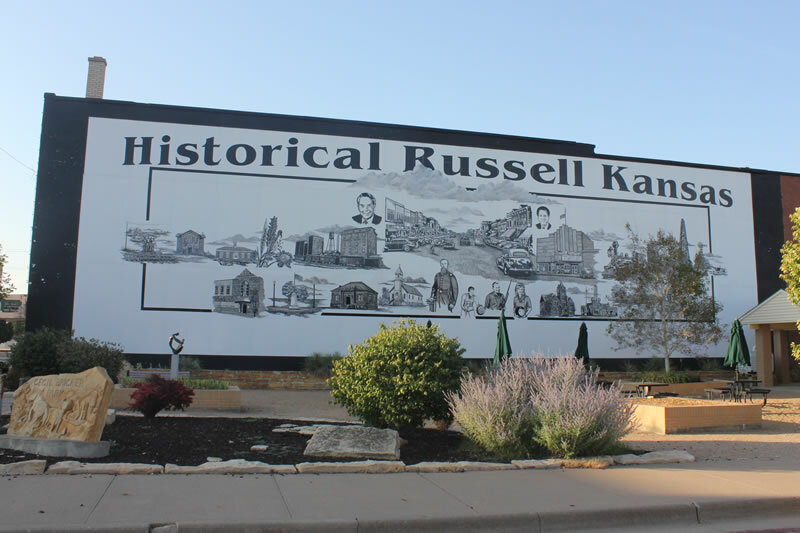 The committee replaced the mural with one that consisted of scenes from Russell’s historical past and was derived from consultation with the Russell Historical Society and the Kansas Historical Museum in Topeka. The scenes were used to make an historic collage of Russell dating from 1871 to the present. It was constructed on Mega board and sealed for lasting preservation. The scenes were affixed to the building in the location of the existing mural. ROAR chose artist Rick Rupp, of Victoria, Kansas, to do the historical project. It was the hope of ROAR that the mural would archive the history of Russell and recognize the legacy of past leaders, thus inspiring leaders of the future. The project was started in May 2010 and completed in May of 2011. Located at 9th St. and Main St. In the summer of 2010, the ROAR committee asked G. J. Long if he would come up with a design to replace the mural on Ninth and Main Street using the subject matter from the Prairiesta theme, “Windmills to Wind Power”. With that in mind, G. J. designed a drawing that would cover 300 feet long by 15 feet high surface. He captured the historical events by incorporating the oil field, farming, and most recently, at the time of inception, renewable energy. The basic concept for the mural was a stylized representation of a Russell County landscape horizon. The mural was started in the summer of 2010 and completed May of 2011.